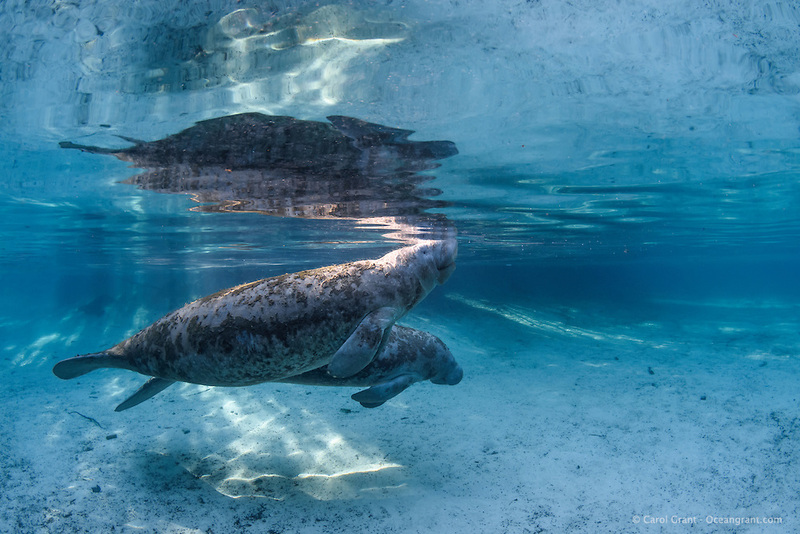 Manatee mother and calf swim next to each other in the gorgeous spring blue freshwaters of Three Sisters Springs. This manatee calf is nearly as big as mom. Calves stay with their mothers for two years and grow substantially in that time. Crystal River National Wildlife Refuge, Kings Bay, Crystal River, Citrus County, Florida USA. Florida manatee, Trichechus manatus latirostris, a subspecies of the West Indian manatee, IUCN Endangered but proposed downlisting to Threatened by USFWS for 2017: http://www.iucnredlist.org/details/22106/0. Nikon d7200 1/80 f8 Tokina 10-17 at 15mm ISO 400 Subal Underwater Housing, Subal 8" dome port, natural light. Post-processing is normal listed actions.